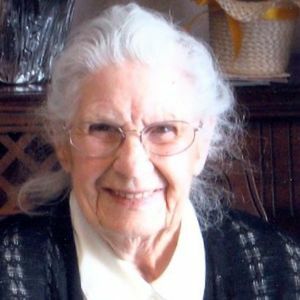 Phyllis I. Kost, 89, Wahpeton, ND, formerly Bowdon, ND, passed away Tuesday, December 11, 2012. A visitation will be held Friday, December 14, from 4 PM to 7 PM at Willow Creek Chapel, Wahpeton. Vertin-Munson Funeral Home, Wahpeton, ND, is in charge of local arrangements. A Funeral Service will be Monday, December 17, 10:30 a.m., at Bowdon School Gym, Bowdon, ND, with visitation Sunday from 2 PM to 5 PM at Nelson Funeral Home, Fessenden, ND and one hour before the service on Monday. Interment will be at Wayside Cemetery, Bowdon, ND. Phyllis Irene (Goughnour) Kost was born February 5, 1923, to William and Jenny (Braaten) Goughnour in Hatton, ND. She grew up on the family farm south of Hatton with her five brothers and sisters. Phyllis graduated from Hatton High School in 1941. She attended Mayville State Teachers College and graduated with a "standard" in 1943. She received her BA from Mayville State College in 1971. In 1946, she began teaching in Martin, ND where she met Wayne E. Kost and they were married November 4, at the home of his mother Tillie Kost. Phyllis and Wayne farmed at Martin, ND until 1949. They lived in Hatton, ND until 1952 where Wayne worked for a potato company. In 1956, they purchased a farm south east of Bowdon, ND. They farmed in the summer and lived at Stanton in the winter, where Phyllis taught school and Wayne managed the NR Truck line. In 1959, they returned to the farm where they raised grain and livestock until Wayne retired in 1999 due to poor health. They moved into Fessenden, ND. After Wayne died in April of 2000, Phyllis lived in Carrington, ND. The fall of 2001, she moved to Wahpeton, ND to be near her children. In November 2011, she became a resident of St. Catherine's Living Center where they provided her with loving care and attention. Phyllis was a dedicated teacher, who had a genuine interest in children and helping them learn. She taught in Bowdon, Sykeston, Berlin, and Manford country schools, all of North Dakota. She was a foster grandparent for the Wahpeton School System until the age of 87. She loved the cards and letters that came for Grandma Phyllis. She loved to read her bible and attend church convention where she could hear the gospel story. The daily crossword puzzles were her entertainment as she cut them out of the Fargo Forum after she had read the paper from the front to back. Phyllis was an excellent seamstress. She passed on her talent to her girls and grandchildren. They enjoyed many quilt retreats and pretty quilts under her guidance. Phyllis is survived by her children: LaVonne (Curt) Beckler, Fergus Falls, MN; Lee Kost, Watford City, ND; Kelly (Pat) Kost, Bismarck, ND; Lucinda (Steve) Wallner, Wahpeton; her brother Myron (Ronnie) Goughnour, sister Ada (Elroy) Bjerke, sister-in-law Sylvia Goughnour; grandchildren: Heidi (Chris) Sylte, Dana (Megan) Beckler, Kassie (Rich) Lacina, Jeremy (Ashley) Wallner, Amanda (Aaron) Bulman, Andrew (Heather) Wallner, Tate Wallner and Tia Wallner, great grandchildren: Josie, Avery and Colby Sylte, Tristen and Kytell Kost, Carter Wallner, Riley and Jack Lacina, Parker and Paxton Wallner. She was preceded in death by her husband Wayne, her parents, grandson Kristopher, sister Eunice and brothers, William and Victor. May God bless you as you deal with your loss. I always enjoyed my visits and the years we taught together in Bowdon. My thoughts and prayers are with you. My prayers go out to the family. Your Mom was my 5th and 6th grade teacher in Bowdon. She had much dedication to her students and her love of teaching will be remembered always. Deepest sympathy to the family. We enjoyed visiting with her when we had the chance. Our deepest sympathy to your families. Your mom always had a smile and always enjoyed visiting. I feel badly that I won't make the service. Our thoughts and prayers will be with all of you. Our sincere sympathies in the loss of your mom, grandmother. The age of the person doesn't matter when it is YOUR MOM. I remember well when our moms died also and try to share your grief. Love from both of us.